Russian President Vladimir Putin and President Xi Jinping will side with DPRK in any US military action. Can the Americans pehaps manage to escape this time again from such a well placed "cajole" that aiming to put a lasting closure on US's global expansion? Of course the Yankees were always luck by the default of United Nations that monopolize the entire world for Americans' favor,as been the case when UN declared a cease fire under Armistice which was signed on 27 July, 1953, to end the Korean war. It's obvious now that the Armistice was not conformed upon a true transparency among the participatory, especially at one polarity where Americans never forgive their old foes and oftentimes continue seeking revenge against DPRK. The Americans already forgot how serious they were humiliated in Korean proxy war by the joint communism pact of Soviet Union and Chinese Red-Army who eventually came into the conflicts on the behalf of North Koreans.Thanks to the Armistice agreement that save Americans and avoid the Korean peninsula to be reunited under one red banner of communism. If US and allies wage war against North Korea again, please be reminded that all the enemies of imperialists and more particularly the United States of America will unite together in a common goal to degrade the empire once and for all. President Donald Trump at the United Nations earlier this week threatened to “totally destroy” North Korea and its 26 million people,the flirty utterance was additional to already fragile diplomacy exists between two enmity nations. Take a note that there is a growing tension within Trump's administration, on how to handle the North Korea's nuclear issues. Some Americans including President Donald Trump himself and small portion of congressman are supporting military action against Kim Jong un's regime. And while other top brass in military and government like the Secretary of State Rex Tillerson advocating diplomacy and sanctions as a solution. Rex Tillerson was on the verge of resigning amid mounting policy disputes and clashes with the White House's officials who misleading the president of United States, by insinuating the prominence that Trump has more power to initiate a military action without even the approval from congress. Tillerson had openly disparaged president Trump, referring to him as a "moron". People like Tillerson they quite understand very well the international backlash and the serious gravity the United States will endure once opting for war with North Koreans. Of course we should indicate that North Korea is not alone, and you shouldn't daunt about that, because you see already the sign on the wall! Although, the regime is diplomatically under pressure and economically is isolated, this doesn't equate that no body will come at its aid in case if US launched a pre-emptive attack. Chinese destroyers descend on Kaliningrad to join Russian Flotilla for major Baltic Sea war games. The active presences of Russian and Chinese warships that move about Okhotsk's waters at the north of Japan for a major naval exercise, which is a constant war game ever carried by two pro-communistic nations, trying to send an indirect message to Trump who escalates his rhetorical assault on Kim Jong un and warn military action. Beijing and Moscow, possessing the most-powerful fleets in the world that can able to bait or U.S' military action. 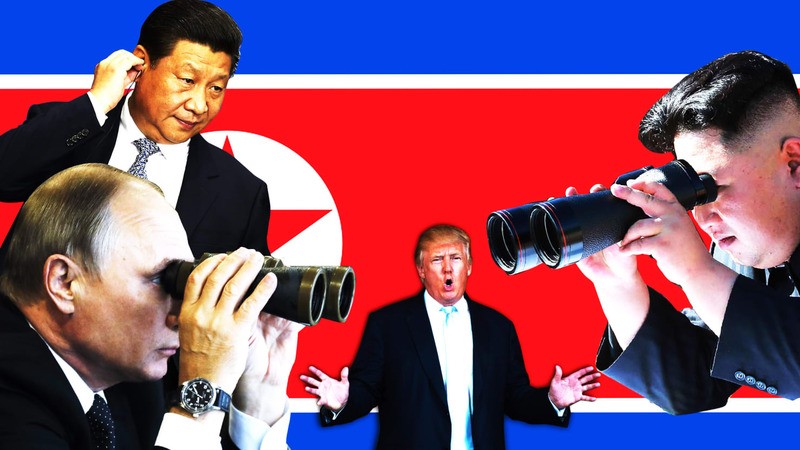 The joined military maneuvers of new Sino-Russian Pact is already building up its dominant metaphor that could contain the American armada in the event Trump drives the United States to war with North Korea. The Joint Sea 2017 is a clear signal to NATO and US, whose reign is expiring, that the "Red Leviathen" has reborn. 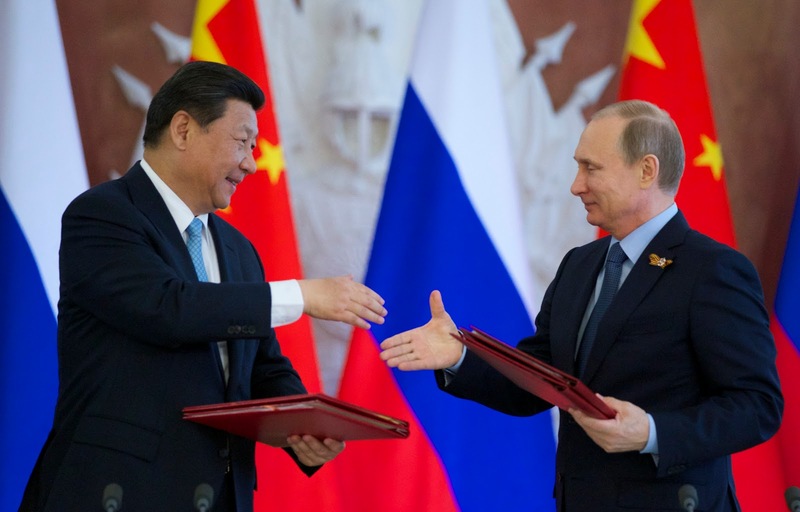 Russian President Vladimir Putin and Chinese leader Xi Jinping exchange documents at a signing ceremony. Chinese warships include Changsha destroyer have arrived in Russia’s Kaliningrad region. Putin has consistently warned any action that threatening North Korea with war. “Do not succumb to emotions and drive North Korea into a corner,” Putin said during an economic forum in Vladivostok. “Now more than ever, everyone needs to be calm and avoid steps that lead to an escalation of tension. But even while he urges calm, Putin and Xi have strengthened military ties between the two countries and aligned their forces against the United States and its own Asian and European allies. Beijing reiterated its plea for peace talks after the bellicose rhetoric between the United States and North Korea reached new heights in recent days, following Pyongyang's sixth nuclear test early September this year. China hopes Washington and Pyongyang realise that "blindly flaunting one's superiority with words to show off and mutual provocation will only increase the risk of confrontation and reduce the room for policy manoeuvres", said foreign ministry spokesman Lu Kang. "A war on the Korean peninsula will have no winners and would be even worse for the region and regional countries," Lu told a regular news briefing. In July, the Russian government announced a new naval strategy primarily aimed at curtailing the “ambition of all range of hostile states, and foremost the United States of America and its allies, to dominate the high seas.” The strategy calls for new submarines and surface vessels armed with long-range cruise missiles, both of which ship types are taking part in the war game alongside the Chinese, this's a warning to the United States to Keep its ships and planes away from North Korea. 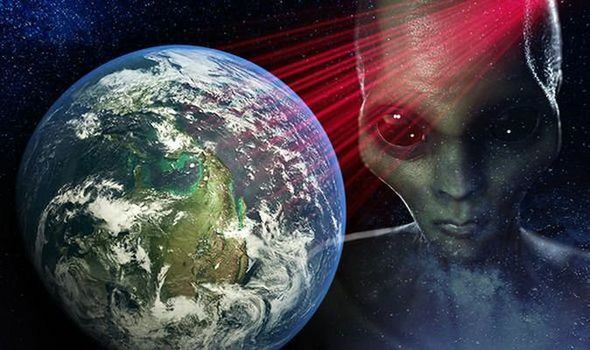 The Science and Tech weblog, is about science,technology,esoteric and international breaking news with national interest. This's extraordinary news and is worth for sharing!